Ahoy there. I featured this rare 1978 live recording, from the Montreux Jazz Festival, on AD in October of 2005 as part of the original Live Upload Series. I suspect a good many of you were not following the blog way back then, so with New Orleans’ Jazz Fest on the horizon I’m re-upping it here. I have several live “albums” from this New Orleans piano master, and Live @ Montreux is by far the best. Very raw arrangements with Booker backed by a loose pick-up band that just swings. Spiders on keys, indeed. If you’re unfamiliar with James Booker and/or traditional New Orleans piano-based music, this set, some Dr. John and a Professor Longhair collection are a fine introduction. I’ve long had an affinity for this stuff and will be posting some other choice, related, nuggets leading up to fest so stay tuned. Booker was the king—fucked up, yes—but the king nonetheless. Brilliant. If you can find it (as it’s often out-of-print) read the Booker excerts in the Dr. John biography “Under a Hoodoo Moon.” Wild/fascinating tales. The below video of Booker performing “Papa Was A Rascal” is taken either from a French television performance from the same year – presumably from the same tour – or from the Montreux session itself. The exact date of the performance is up for debate among fans. Another great festival in Louisiana this weekend is the Festival International de Louisiana, in Lafayette. I love the can of Schlitz in that photo. 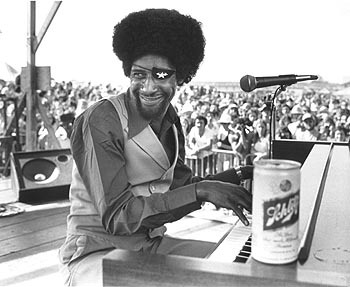 Stoked for this documentary on James Booker. Thank you for this – it’s incredible. Any chance you have a working download link for the Beirut “Black Sessions” recording? The links on the original page (https://aquariumdrunkard.com/_newness/2008/07/22/beirut-the-black-sessions-paris-2007/) don’t seem to work. Thanks also to mike for the link to the documentary trailer. For any of yall gonna be in New Orleans for the fest, there’s an excellent show of Booker portraits gonna be hanging at the 1022 Gallery. They’re really intimate, unique, and funny portraits taken by Booker’s longtime friend Jim Sheurich. Check it out. I guarantee you will not see these images anywhere else. 1022 Lowerline, NOLA 70118. May 1st-June 30.
thanx for this upload, great takes indeed. Needed some good pre-Fess traveling tunes; thanks for these! Someone gave me a great rehearsal session he did with Garcia in ’76. Been hooked ever since. As a piano player myself, this guy is inspiring. Have always loved Dr. John but this is my first time hearing Booker. What style. Thanks for the great post. Jazz is great and often under appreciated by the youth. I went in 2008, skipped, 2009, looking forward to 2010. Wow, this was a really high quality post. In theory I’d like to write like this too – taking time and real effort to make a good post… but what can I say… I procrastinate alot and in no way seem to get something done.